8-year old Una moves to Midburg with her constantly arguing parents. Little does she know that underneath the city, the Dark World prepares to annihilate all the humans above. Una will have to embark on a terrifying quest to steal the magic Amulet from the bloodthirsty Master of the Dark World to save her family and the whole town. Writer's Statement: Adults often are so immersed in pursuing personal goals that they neglect their relationships. Tensions between parents too often culminate in separation or divorce, leaving in their wake children who are confused and bereft. New romantic relationships may come and heal some wounds, but this does not in any way guarantee the children's wounds will ever be healed as well. 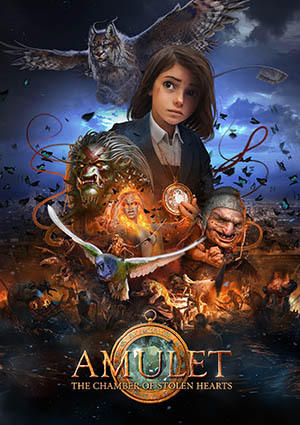 'Amulet: the Chamber of Stolen Hearts' uses fantasy as the conductive element to talk about these issues to the younger generations. It helps us understand that Love, if neglected, is not enough to hold a family together. That Love needs to be nurtured to keep it alive and strong; not just for us but, more importantly, for out children.